NOTE: Keep any grease off the brake disc and the brake pads. 2. Remove the rear wheel. 3. Release the parking brake lever fully. 4. 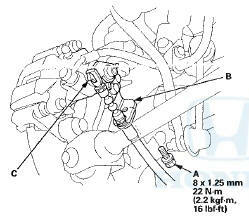 Loosen the parking brake cable adjusting nut (see page 19-8). 5. Remove the flange bolt (A) from the arm (B). 6. Disconnect the parking brake cable from the lever (C). 7. Remove the brake hose mounting bolt (A). 8. Remove the brake caliper bracket mounting bolts (B), and remove the caliper assembly (C) from the knuckle. To prevent damage to the caliper assembly or brake hose, use a short piece of wire to hang the caliper assembly from the undercarriage. Do not twist the brake hose and the parking brake cable excessively. NOTE: Make sure the washers (D) are in position on reassembly, if they are removed (see step 8 on page 18-39). 10. Remove the brake disc (B) from the hub bearing unit. NOTE: If the brake disc is stuck to the hub bearing unit, thread two 8 x 1.25 mm bolts (C) into the brake disc to push it away from the hub bearing unit. Turn each bolt 90 degrees at a time to prevent the brake disc from binding. 11 . 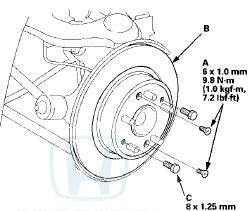 Install the brake disc in the reverse order of removal, and note these items: - Adjust the parking brake (see page 19-8). - Before installing the brake disc, clean the mating surfaces between the hub bearing unit and the inside of the brake disc. 12. Inspect the brake disc runout (see page 19-33). 13. After install the brake caliper, make sure the clearance between the lower arm B and the parking brake cable is more than 5 mm (0.20 in). 14. Clean the mating surfaces between the brake disc and the inside of the wheel, then install the rear wheel.